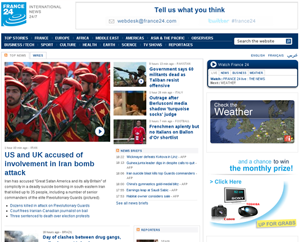 France 24 is a public 24/7 international news channel broadcast in three languages: French, English and Arabic. Its mission is to cover international current events from a French perspective and to convey French values throughout the world. The channel provides keys to understanding complex events through in-depth analysis. France 24 also puts culture at the forefront of its programming. France24 is part of the AEF (the “Audiovisuel Extérieur de la France” or French foreign media), along with RFI (a radio station) and TV5 (a TV station). Launched in December, 2006, the website was originally based on a Java CMS, Magnolia. But due to stability problems, we switched to Drupal 5 in mid-2008. We have just migrated to Drupal 6 and a brand new codebase. This case study covers this migration, focusing on the technical part, and describes some of our homegrown modules to be open-sourced. The monthy traffic of the France 24 websites is around 5 million unique visitors. A more geeky metric is that the site runs 300-400 concurrent active Apache threads at all times.